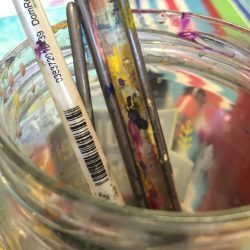 So, no joke, I’ve challenged myself to post on my blog every day this month. I thought it would be fun to show the day-to-day things that go on with my art life, from the creating, the marketing, the networking, etc. Here’s what I’ve been up to the past few days. 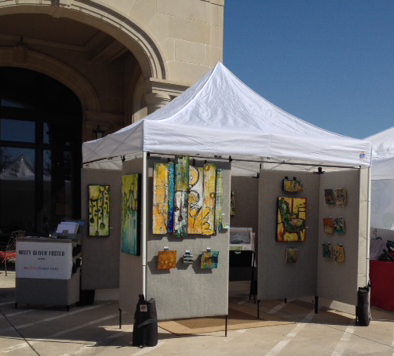 Over the weekend, I was a part of the Arts in the Square here in Frisco. The weather was gorgeous, and there were tons of people that came out (thanks to all of my friends that stopped by). I got to meet a lot of new people, too, which is always fun. 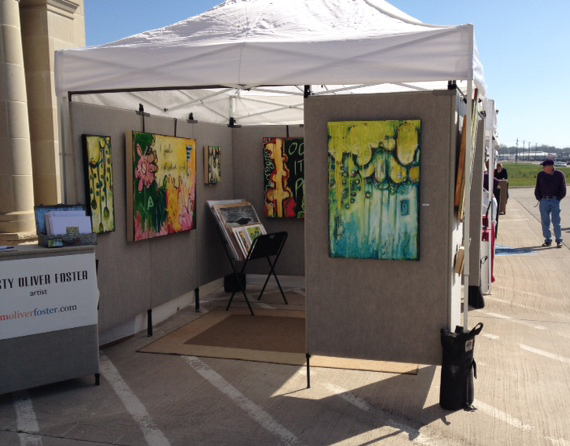 Here’s a shot of my booth – I had such a sweet setup on Saturday. I did learn, however, that even though it was only 70 degrees, it’s not a good idea to put your encaustic art in direct Texas sun. Don’t worry, nothing was damaged, but I had to shuffle those pieces to the shady areas after lunch. Sunday morning greeted us with crazy strong winds, so we had to adjust the booth layout a bit (we didn’t really have a choice). At one point that morning, all the walls were down, and there were about 5 volunteers helping us hold things down so it didn’t blow away. Not fun. But, thanks to my logistically gifted husband, we got it back together and had a good Sunday, too. I went to bed Sunday night feeling like I was still swaying in the wind. Tonight I went to hang out with some friends at the Visual Arts Guild of Frisco. 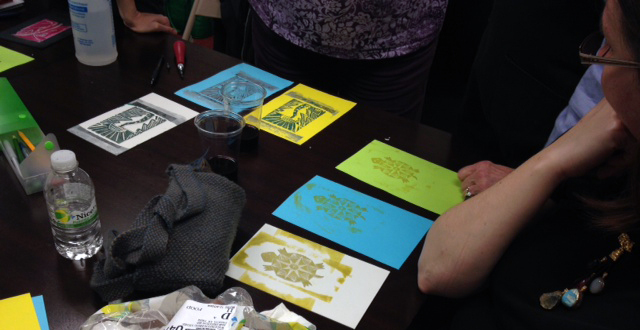 I took my youngest daughter and we had fun doing some printmaking. Thanks to Deborah Gallatin for her great demo. Here are some works in progress by a couple of artist friends of mine, Kelly Bartlett and Linda Brooks Alred. Looking good, gals.